MOSS is a robot construction system from Modular Robotics. Each block is a different part of a robot and combining those blocks in different ways yields a multitudinous variety of robots. 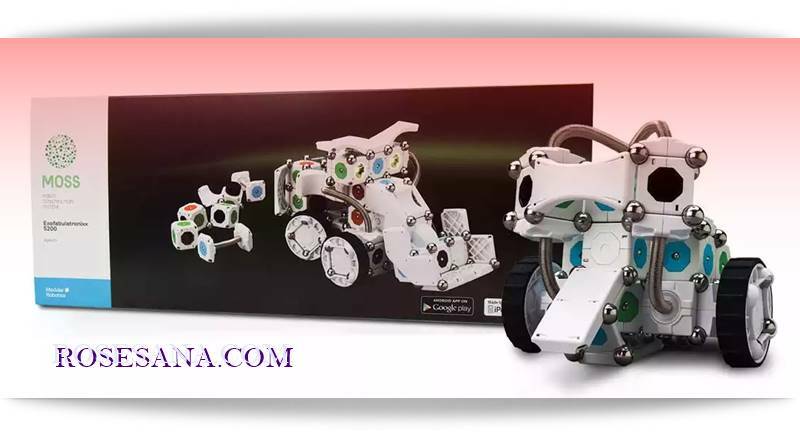 Think of them as building blocks for the 21st century; designed to help kids invent and build their own robotic creations. The goal of MOSS is to impart intuitive understanding of complex systems and design principles. Within the MOSS system, kids begin to build an understanding of mechanical construction, basic circuitry, kinematic motion, robotics, software integration, and programming. The Exofabulatronixx 5200 includes 52 MOSS blocks and 140 Steel Spheres. The kit is powered by a rechargeable lithium polymer battery and includes a Micro-USB charging cable. The Exofabulatronixx 5200 includes an Extended Battery, 2 Motors, 2 Pivots, 2 Flashlights, 2 Brightness Sensors, 2 Proximity Sensors, Microphone Sensor, a load of connection blocks, and support braces. The most unique block in this kit is the Double Brain Block, which lets you connect to your iOS or Android devices using Bluetooth. When paired with our suite of free mobile apps, you can create your own remote control vehicles. In addition, you can connect to a Mac or PC to reprogram your robot to exhibit new behaviors. MOSS is remarkably intuitive. Color-coded faces indicate how each block works and by snapping blocks together, kids create not only the physical body of the robot, but its behavior, too. There's no programming required, the robot is "programmed" by how its blocks are put together. Once you understand the basic principles there is no limit to what you can create. Power or data are passed through an elegant single button contact, while ground is passed through the steel spheres.